Mesa Arizona is the 38th largest city in the United States and the 2nd largest in the Phoenix metro area. Mesa has a rich aerospace history which includes Falcon Field and Williams Air Force Base ~ now known as Phoenix-Mesa Gateway Airport. Mesa is also home to a large Boeing facility in North-East Mesa. Mesa is a major hub within the Phoenix Light-Rail System and it invites adjoining cities to participate in festivities and various events that occur in downtown Mesa. Mesa is home to an impressive array of top-rated educational institutions such as: Mesa Community College, ASU Polytechnic Campus, East Valley Institute of Technology (EVIT), Chandler-Gilbert Community College-Williams Campus, Northern Arizona University-Mesa, and A.T. Still University. 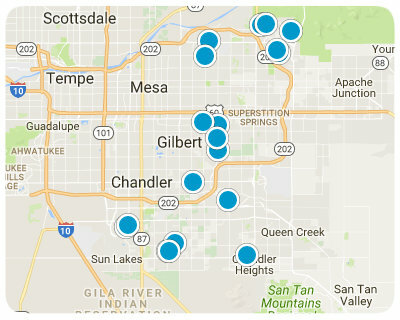 Below are ALL of the Homes for Sale in Mesa AZ from our Realtor MLS UPDATED EVERY 5 Minutes! That means EVERY home from EVERY Real Estate Company that is currently for Sale. You can also view ALL Homes for Sale in Mesa, Mesa Condos, Mesa Foreclosures, Mesa Short Sales, Mesa Townhomes and Luxury homes in Mesa. You can filter your search at the top by price, size, etc. Check out the popular 1-Click searches like Mesa Homes for Sale with a Pool or Horse Property for Sale in Mesa Arizona. If you find a home you want to see or have any real estate questions call/text us at (480) 422-5358 or click the LIVE CHAT below.